Career obsession can often substitute for dealing with underlying mental-health issues. From Davos to Tokyo to Silicon Valley, executives are steadily bracing the issue of mental health. That’s a good sign. But the world has a very long way to go in creating workplaces that support psychological well-being. 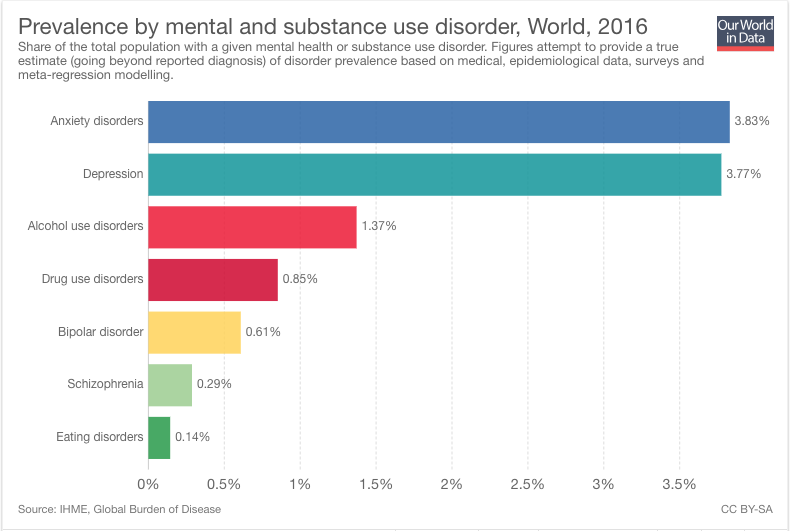 “The lost productivity resulting from depression and anxiety, two of the most common mental disorders, is estimated to cost the global economy $1 trillion each year,” says Dr. Dévora Kestel, director of the World Health Organization’s department of mental health and substance abuse. I know from experience how well workers’ mental struggles can remain hidden in plain sight. No one knew about mine for most of my career. But in recent years, I went through a transformation (that’s still a work in progress) and got the help I needed. Now, I’m working to help create a culture conducive to mental health at my company, G2.com – partly by being open about my story. When you see executives behaving erratically (such as Tesla’s Elon Musk), it can serve as a powerful reminder that many executives face mental-health challenges. Just like with anyone, these often stem from childhood experiences. As a boss, I’ve been both erratic and cut-throat at times. For years, I was often emotionless and driven to work endlessly. I craved the next goal, the next level of success, with a kind of desperation. I couldn’t understand why those around me didn’t share the exact same drive that I had. I didn’t realize that they were living their lives and accepting their emotions, while I was avoiding mine. It was only after I achieved my goal of becoming CMO of a tech company before the age of 30, and I still couldn’t feel happy, that I realized I had a problem. Through therapy, I learned where it came from – years of incessant bullying as a child growing up in Sydney, Australia. I was quite shy in elementary school and more sensitive than other kids, so I often preferred having conversations with adults. The tormenting I experienced was so intense that my memory ended up largely blocking out years of my early life. Career success became an obsession, and I chased it relentlessly. Since I’ve worked to heal, I’ve seen the positive effects not just in my life, but also at work. I’m more productive and more satisfied. I’ve stopped beating myself up with endless negative self-talk. Instead, while at work I try to focus all that energy on being compassionate to those around me, while driving innovation and getting my job done. If you asked my colleagues at work, I believe, they’d agree that my relationships with all of them are better. They feel more valued and excited to come to the office. And perhaps most importantly, we’ve taken crucial steps to ensure our entire company values and supports mental health. I speak openly about therapy, and make my twice-weekly sessions on my calendar public for everyone at work to see. By doing this, I show there’s nothing shameful about it. The goal is to remove the stigma that keeps people from acknowledging and seeking help for their own mental health. To help advance these efforts, I recently joined the organization Bring Change to Mind, founded by actress and activist Glenn Close, as a board member. My employees have a standing invitation to come talk to me about any concerns that they feel may impact their work. That includes personal things if they wish to share. It’s part of the open door policy I follow in general. Ever since I began speaking about my own experience with mental health, more and more people at G2 have come to talk with me about theirs. Push your employees to not check email at all hours and to fully unplug when they’re on vacation. And push them to actually take their vacation days. Far too many of those days go unused around the globe, despite studies showing that taking vacations makes workers more productive. I recently took a three-week vacation and didn’t open my inbox once. I felt refreshed and energized, and my employees saw that I mean it when I tell them to do the same. Even with the best of intentions, your business’s efforts might not achieve the results you seek. Organize regular anonymous surveys of your employees to gauge their stress and mental well-being. Keep making changes until you see real progress. By taking action, businesses can make big strides toward building more mentally healthy societies. And those of us who have confronted our own challenges can help lead the way.